Naga has a lot of accommodations to choose from ranging from hostels to fancy hotels. Naga Land Hotel is situated in the heart of Naga City. It is located in front of a shopping mall and is walking distance to San Francisco Church, Naga Metropolitan Cathedral and Rizal Park. It is also one jeepney ride to Basilica Minore of our Lady of Peñafrancia and Shrine of our Lady of Peñafrancia. 2. Aristocrat Hotel 45 Elias Angeles St., Naga City (054) 473-3607 3. Avenue Plaza Hotel Magsaysay Ave., Naga City (054) 473-9999 www.theavenueplazahotel.com 4. Villa Caceres Hotel Magsaysay Ave., Naga City (054) 473-6530 to 33 info@villacacereshotel.com www.villacacereshotel.com 5. Golden Leaf Hotel 40 Misericordia St. Tinago, Naga City (054) 472-6507 Where to Eat in Naga City 1. Bob Marlin (Crispy Pata) Magsaysay Ave., Naga City (054) 473 1339 2. Bigg’s Diner Elias Angeles St., SM City Naga, Magsaysay Avenue (24 hours), J Miranda Ave. (054) 473-1212 3. Naga Garden Restaurant Panganiban Drive, Naga City (054) 811-8805 Things to do in Naga City 1. Church Hopping Naga is home to several historical and heritage churches. Every September, people flock to Naga City to celebrate the Feast of the Blessed Virgin of Penafrancia. Anytime during teh year, you can experience the Pilgrim City of Naga by visiting Naga’s heritage churches such as the Basilica Minore, Penafrancia Shrine, Naga Metropolitan Cathedral, San Francisco Church and the Porta Mariae. 2. 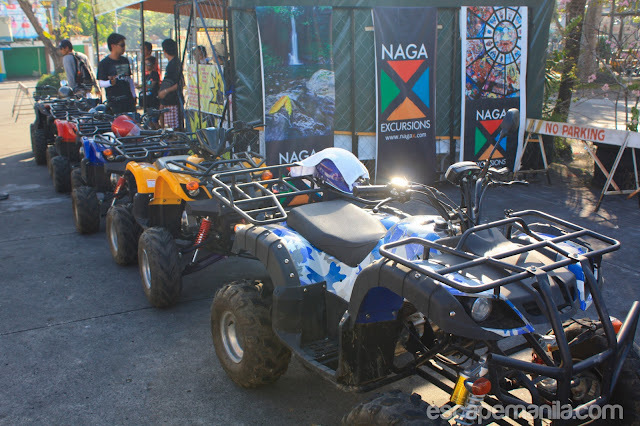 ATV Ride to Malabsay Falls One of the newest things to do in Naga City is the ATV Ride. I have tried it once and it was such an adrenaline pumping experience. A must try while in Naga really for those who wants adventure. 3. Visit Panicuason Hotsprings Resort The resort is situated in the foot Mt. Isarog. It offers a number of natural pools with different temperature from as low as 20 to as high as 39 degrees Celcius. 4. Food Trip One of the most interesting things to do in Naga is food tripping. Naga is home to a lot of gastronomic satisfying dishes. Some of the most sought-after dishes are Bicol express, laing, Pinangat, Kinalas and Toasted Siopao.